EAFORD and Geneva International Centre for Justice welcomes the report of the Working Group from the Nineteenth and Twentieth sessions. 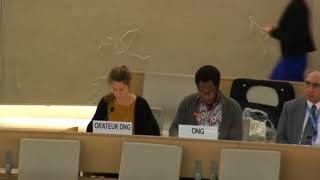 While we agree that the Sustainable Development Goals address intersectional racial discrimination on People of African Descent and can help eliminate such discrimination we also agree that the Durban Declaration and Programme of Action is vital in terms of addressing adequate guidelines and recommendations for the elimination of racism and racial discrimination. The DDPA also rightly takes into consideration colonialism and acknowledges the adverse after-effects it has had on Africans and People of African Descent.